Leave a comment by Friday, May 28th and you’ll be entered in a drawing to receive an advanced copy of this book. Drawing includes comments from this blog and the Wordsharpeners Blog. Mothering is part art, part science, and always a work in progress! Backed by more than thirty years of research-based ministry at MOPS International, Momology is designed to help you be the unique mother God created you to be–because better moms make a better world. “A treasure book filled with practical, informative, inspiring, and creative ideas to help guide moms in raising happy, productive, God-loving children.”–Fern Nichols, president, Moms in Touch Intl. “The ideas and solutions from real moms in Momology ooze with authenticity and demonstrate how other moms not only survive, but thrive.”–Dr. Mary Manz Simon, practical parenting specialist. Shelly Radic is Chief of Staff at MOPS International, author of The Birthday Book, and a regular contributor to MOPS publications. Her writing is informed by her education, mothering her four children, and twenty years of MOPS experience. She lives in Colorado. I wish I’d had this book when my children were growing up. This is more than a how to book for the day to day tasks of parenthood. This book teaches concepts that will help you be a better mom. This is a great resource on parenting to offer to the young moms in your church. I highly recommend this book. 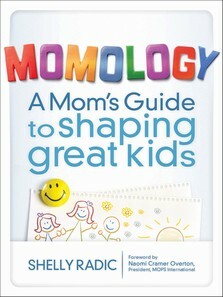 This entry was posted in Free Give-Away, Ministry Resources and tagged children's minsitry resource, Momology, MOPS. Bookmark the permalink. Just announced “Momology” as the new theme for our MOPS group today!! So looking forward to this theme this year in MOPS! It’s gonna be so fun! Sounds like a wonderful book~~thank you for the opportunity! I cannot wait to start my 1st official MOPS year with this theme. I am REALLY looking forward to it. Congratulations, Lauren. You’ve won “Momology”. I am excited to read this book. I am also thrilled to be able to share this adventure with other moms. YAY for MOPS.. I am so grateful for you mommies… I could not have made it through this year without you. Thanks for welcoming me in to your group with wide open arms!!!!! I’m so excited to get my hands on this book. Just by the description, it sounds awesome!! MOPS has been a HUGE blessing in my life, I love learning how to parent alongside other moms. I am so excited to be receiving this book. Since the giveaway I have hear more about book and am really looking forward to reading and sharing.